This research proposes an interface titled Belly-C to be used in belly dance performances and aims to test the applicability and possible results of the new technologies applied to traditional belly dance. This project would not be possible without the collaboration and help of Berrak Yedek. Belly-C is an interface that gives the control of some or all elements of the music to the dancer and allows her to generate music through formal belly dance movements. A literature review on the research and application in the fields of physical interaction tools, dance and new music interfaces has been conducted for this research in order to determine the most appropriate method and approach for the proposed interface. Accordingly, the structure of belly dance movements was taken as the basis and the method of inertial movement tracking was selected. Belly-C consists of hardware and a software that has three main modules. The hardware, which consists of sensors placed on the body of the dancer and a wireless sensor interface that transfers sensor data, transmits the movements of the dancer onto the computer environment. The software, which consists of movement recognition module, a mapping module and a voice synthesis module, processes the sensor data and recognizes the movements. It then produces the sounds that match the movements according to a predefined map. 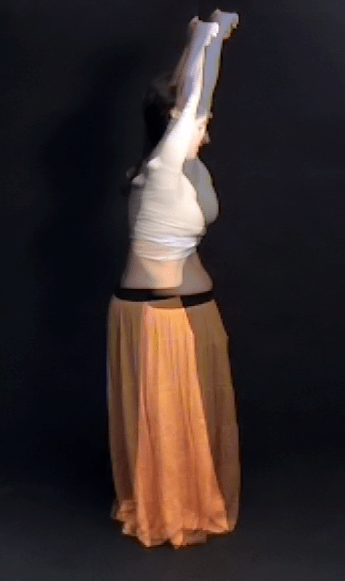 Belly-C presents an approach reverses the basic perception of the belly dance as the dancer accompanying the music by allowing the dancer to generate the music entirely or to contribute to it by using her own body. 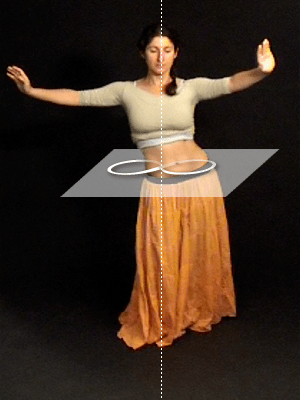 Belly-C applies the mapping relationship between movement and music onto belly dance movement patterns. For this purpose, belly dance movements have been examined and a Basic Belly Dance Movements vocabulary have been drawn up as the basis of the mapping operation. However, Belly-C has been designed as a general-purpose performance tool and can be used for a variety of genres and objectives through variations in its movement and sound libraries. The research application concludes that the method selected for movement tracking is appropriate and that the signatures of the movements can be isolated and detected. However, it was also observed that more developed software than the one used in this research will be needed to perfect the movement tracking operation. By showing that the basic movements are also legible in the continuity of the dance, this research suggests that HMM or other similar methods can be used for movement tracking. The research work with the belly dancer suggests that even though Belly-C stems from the classical belly dance form and stays within its confines, it was a new approach and experience for the dancer. In this vein, it was observed that technology altered the dancer’s perception of her body and that it necessitated a new approach to dance on her part. From the viewpoint and experience of the dancer, it was observed that the resulting performance was less classical belly dance than a new interpretation that builds itself on belly dance. You can download the research report Belly-C (pdf – inTurkish). The web site of the project will be re-activated soon. This research was supported by TUBITAK and was my MA thesis dissertation guided by Prof Oğuzhan Özcan at YTÜ.